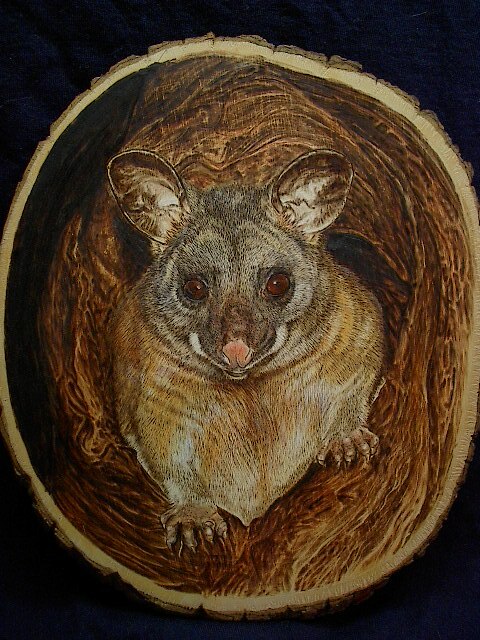 'Brush Tailed Possum' is burnt on a basswood slab. Basswood is not commonly known in Australia, but is well known among the U.S. and Canadian burners because of it's great burning capabilities. It is a soft,even grained, blond wood that is easy to pyro on and easily holds the contrast between burning and natural wood. It takes texture very well, without having to fight the grain and takes colour equally well. (For Australian and international basswood sales, please click here.) This piece was done on an oval of basswood, seeking to give the impression the possum is not only emerging from it's tree hollow, but also from the wood itself. I chose to do this work in colour to give it a richness and contrast. There is often quite the debate between pyrographers about using colour or not. I'm of the opinion that both are very acceptable, depending on the effect you are trying to achieve. While I am a huge fan of black and white pyrography and prefer it over colour, there is no doubt that an autumn scene, a flower or a sunset would lack something in black and white, that only colour can give. For this reason, I work in purely monochrome and also colour, depending on what I am trying to convey. I think of it as being no different than taking care in selecting a specific wood to suit my subject. The colour used here was gouache paint. Gouache is a water based, opaque paint that is particularly good for use on wood. Acrylic paint is also very good, as well as pencil. The Brush Tailed Possum is a native of my home country of Australia. It is about the size of a large, fat domestic cat. They are nocturnal and live in tree hollows, but can often nest in the roofs of houses. I often have Brushtails visit my veranda at night time and always hear them climbing around in gum trees at night.